DENVER, Colorado (CNN) -- Sen. Edward Kennedy declared there was "new hope" for the nation in his surprise appearance at the Democratic National Convention, while Michelle Obama addressed critics of her patriotism and stressed her love for the country. Sen. Edward Kennedy makes a surprise speech before a roaring crowd at the convention. "Nothing is going to keep me away from this special gathering tonight," Kennedy told an arena of teary-eyed delegates as he pledged to see Barack Obama to the White House and his own return to the Senate floor. Before the convention, the ailing liberal icon had made only one public appearance since undergoing surgery for a brain tumor on June 2. 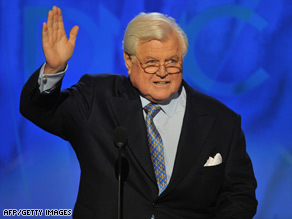 The reception Kennedy got was reminiscent of the reception that his brother, Robert, got in 1964 when he addressed the convention after their brother John was assassinated, said Bill Schneider, a CNN senior political analyst. Republican strategist Alex Castellanos said Kennedy's speech would be "one of the highlights of the evening if not the entire Democratic convention," and CNN contributor James Carville called it "the most emotional thing I have ever seen." "I don't care if you're a Democrat or a Republican -- you're going to be moved by that," he said. The Democratic convention culminates Thursday when Obama formally accepts his party's nomination. Obama, the junior senator from Illinois, will become the first African-American to lead a major party ticket. His wife of nearly 16 years, Michelle Obama, told the packed convention center stories from when she and Obama first met. The woman known as "the rock" in the Obama family also introduced herself as a sister, a mother and a "wife who loves my husband and believes he will be an extraordinary president." "This is the first time most Americans are getting any sense of who Michelle Obama really is. She's a very poised and accomplished speaker, a real professional," Schneider said. "All of us driven by a simple belief that the world as it is just won't do -- that we have an obligation to fight for the world as it should be. "That is the thread that connects our hearts. That is the thread that runs through my journey and Barack's journey and so many other improbable journeys that have brought us here tonight, where the current of history meets this new tide of hope. "That is why I love this country," she said before the cheering audience. The potential first lady caused controversy earlier in the campaign season when she said she was really proud of the United States for the "first time" in her adult life. Those comments were replayed in attack ads from Republicans. Craig Robinson, Michelle Obama's brother, spoke briefly before his sister took the stage. "I don't want to just introduce my sister, I want to introduce you to my sister. The girl I grew up with. The poised young woman I saw her grow in to. The compassionate mother, aunt and sister-in-law she is. The passionate voice for women and children she has become. And the type of first lady she will be," he said before sharing memories from their childhood. Barack Obama addressed the delegates in a short message via satellite at the conclusion of his wife's speech. "Now you know why I asked her out so many times, even though she said no. You want a persistent president," he joked. Obama's two daughters, Sasha and Malia, grabbed the mic to give their father a quick "hello." Monday night's theme was "One Nation." Other speakers included Democratic Party Chairman Howard Dean, House Speaker Nancy Pelosi and Rep. Jesse Jackson Jr. While Kennedy and Michelle Obama earned rave reviews, analysts said the hours leading up to their appearances were largely uneventful. "If this party has a message, it's done a hell of a job of hiding it," said Carville, who was a strategist for Bill Clinton's presidential campaign. Bill Bennett, a political analyst for CNN who served in Republican administrations, said it was "stunning" how little substance was offered up in the first two hours of the convention. "Having worked on the choreography of these before, you need to grab people's attention with a message early on ... not to let these sort of hours get frittered away," he said. Tuesday's lineup will likely be dramatic, as Hillary Clinton delivers the headline speech. Clinton and Obama battled it out in their protracted primary season, and questions still linger over whether her supporters are ready to rally behind her formal rival. Wednesday night features an address from former President Bill Clinton, as well as a speech from Joe Biden, the newly tapped vice presidential candidate. Going into the start of the back-to-back conventions, Obama and presumptive Republican nominee John McCain were tied in the race for the White House, according to a new poll. In a CNN/Opinion Research Corp. poll released Sunday night -- after Obama announced Biden as his running mate, 47 percent of those questioned are backing Obama, with an equal amount supporting McCain. The poll was conducted on Saturday and Sunday, with 1,023 adult Americans questioned by telephone. The survey's sampling error is plus or minus 3.5 percentage points for all voters.